The notion of "heritage" has become one of the global tropes in recent years. At the heart of heritage politics are three questions: what heritage is, who decides what it is, and for whom is the decision made. However, existing work on heritage language has rarely tackled these questions, assuming that teaching children of migrants their "heritage language" empowers them. This book challenges this assumption, situating the notion of heritage language in the host society's involvement in social justice, nation-building efforts, (superficial) celebration of diversity, and investment on global links the migrants offer as well as the migrants' fear of discrimination and desire for belonging, social status, and economic gain. 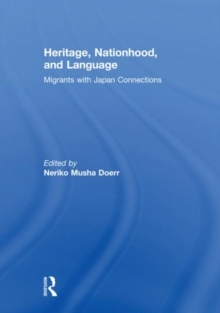 Based on ethnographic research in Bolivia, Peru, the United States, and Japan, the book illuminates the complexity and political nature of determining what constitutes heritage language for migrants with connections to Japan. This volume opens up a new field of investigation in heritage language studies: the complex linkage between heritage language and social justice for migrants. This book was published as a special issue of Critical Asian Studies.